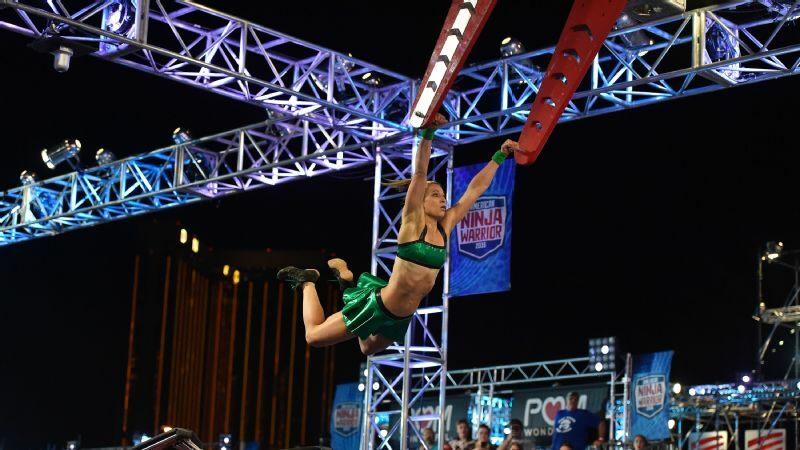 Jessie Graff completed Stage 1 of the "American Ninja Warrior" national finals in Las Vegas, a first for a woman. 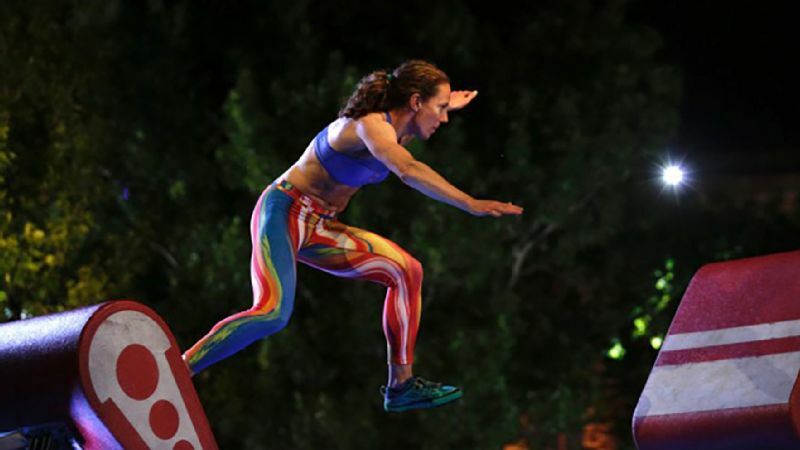 The first night of the "American Ninja Warrior" national finals in Las Vegas did not disappoint. A newly revamped Stage 1 course proved to be quite the difficult task as only eight of the 45 to run the course completed it. Unlike city competitions, in Vegas, ninjas have to hit the buzzer to move on. The star of the night was undoubtedly Jessie Graff, who became the first woman to complete Stage 1. She made history in style, hitting the buzzer with 12 seconds left on the clock, placing fourth on the night. That put her ahead of top ninjas like Grant McCartney and Flip Rodriguez. It was a monumental moment. So much so, that even Lego is celebrating! espnW caught up with Graff to talk about her historic run and what had her nervous about the course ("everything"). espnW: What was going through your mind as you approached the starting platform? 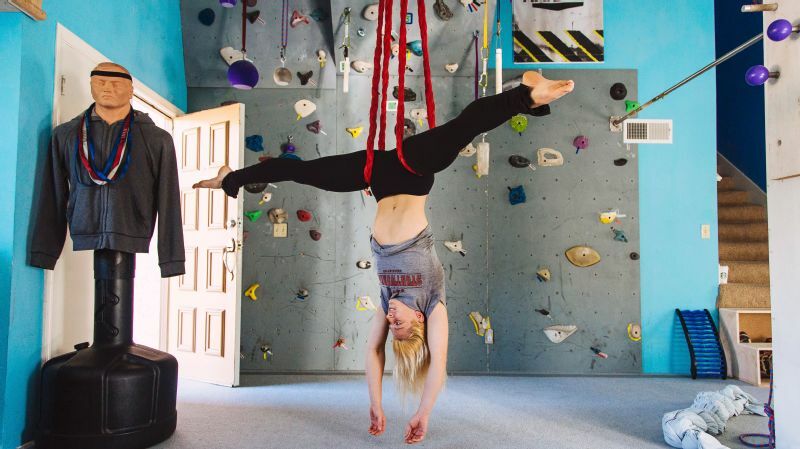 Jessie Graff: Throughout the night, anytime I caught myself thinking about the magnitude of how my life might change if I completed the course, I would immediately redirect my focus to calculating and memorizing the strategies for each specific obstacle. I attack each one, one at a time, and in order, so walking up to the platform, I was thinking about the first obstacle: getting all of the dust off of my shoes before the countdown starts. Slippery shoes will ruin a good Jumping Spider or Warped Wall run, and there's no time to clean your shoes once the timer starts. But waiting for the countdown, my mind was on exactly where I wanted to put my feet on Snake Run. There were so many different ways to approach it, the fastest ways being the riskiest. I committed to the safest route, because I'd seen a lot of extremely strong competitors fall using the slightly more aggressive approach. espnW: What worried you most about the course? JG: Everything. I knew I could do every obstacle on Stage 1, and that I had the endurance to complete them all in the required time. But every obstacle on the course is so tricky, that the odds of making one little mistake that ruins the run is high -- especially when you're rushing. But since this is a timed stage, with a clock counting down to elimination, there's no time to think about strategy between obstacles. 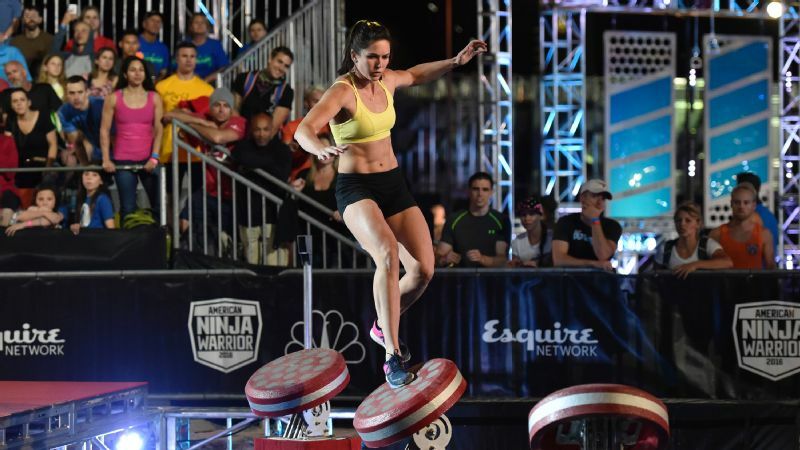 espnW: How did it feel to get up the Warped Wall? JG: I knew I could do it, but I didn't know if I would. I try never to take anything for granted on these courses. Closing my fingers over the rim of the wall was like an overwhelming wave of exhilaration and relief, immediately followed by "go go go!" espnW: What does being the first woman to beat Stage 1 mean to you? JG: I'm excited to complete Stage 1 as an athlete, not just a woman, because it is a deceptively challenging course that has taken out hundreds of stronger athletes than me, male and female. Hitting the buzzer proved my ability to analyze, strategize and make quick adaptive decisions under pressure -- which is one of the most important things you can know about yourself. When the pressure is on, stakes are high, and emergency strikes: will you react intelligently, or freeze up? Knowing that I can conquer the most finicky, volatile course, under the most pressure, gives me the confidence to know that whatever challenges arise in my life, I'm capable of staying centered and making the best decision possible. As far as being the first woman to do it, there are more women than ever who are fully capable of doing what I did, and even more. I'm grateful that it came together for me on the right night, and looking forward to seeing more women hit that buzzer in the future. espnW: What do you hope people take away from watching you this season? JG: You're stronger than you think and can achieve more than you ever imagined no matter the obstacle you're facing, if you're willing to work for it. Expect things to feel impossible at first, but do the progressions, and your perception of impossible will change. Fitness is fun. Find sports that you like, and set goals that inspire you, so that working out feels like playing. Surround yourself with people who share common goals and are willing to walk (or in my case swing and jump!) with you through it all. Never let anyone tell you "you can't, because you're a girl." We may have to train smarter and harder, to keep up strength-wise, but if we surpass them in technique, strategy and quick thinking, we can beat the guys. 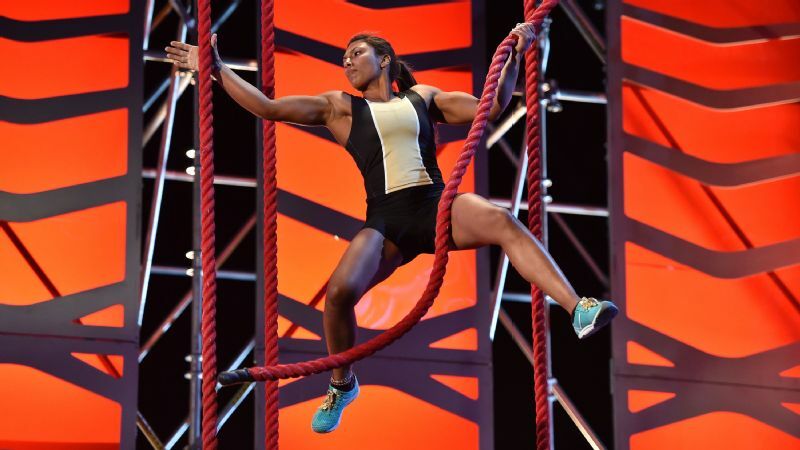 I have improved every year that I've competed on ["American Ninja Warrior"] -- not only despite a blown-out knee/ACL surgery, but in large part, because of it. A knee injury is just an opportunity to build amazing upper-body strength. Try to look at every setback in terms of how you can grow from it, and you'll always keep moving forward. Here's the video of Graff's historic run! Unlike the city qualifying and finals courses, Stages 1 and 2 are timed. In Stage 1, ninjas have 2 minutes, 20 seconds to complete the eight obstacles of the course. The first obstacle, Snake Run, is new. Competitors traverse the steps, choosing their own path to get to the next platform. They are deceptively difficult and caused problems for even the most experienced ninjas. 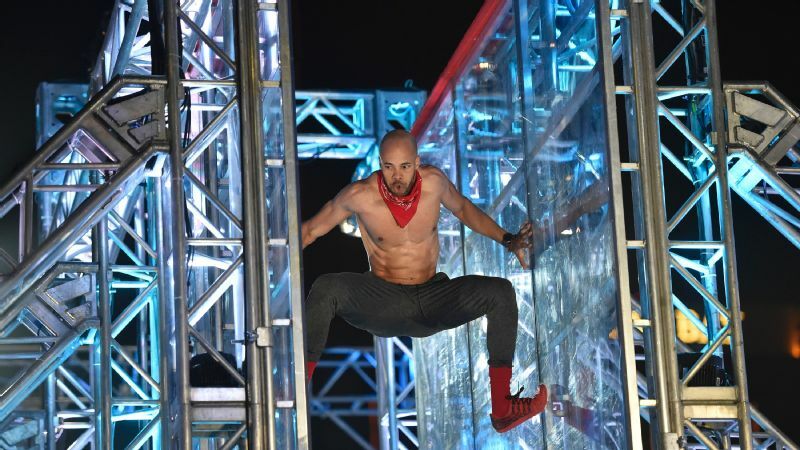 Jesse Labreck competes in Stage 1 of the "American Ninja Warrior" national finals in Las Vegas. 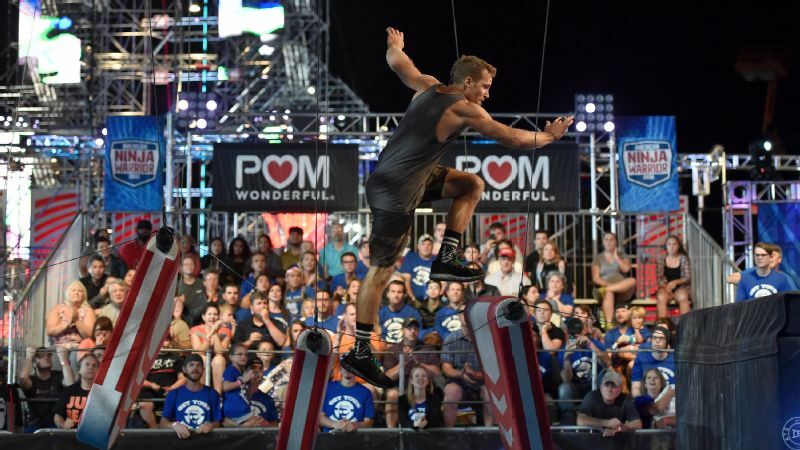 The Propeller Bar returns as the second obstacle. Ninjas jump from a trampoline to a hanging propeller. Then, they must transfer to a rope and swing to the next platform. 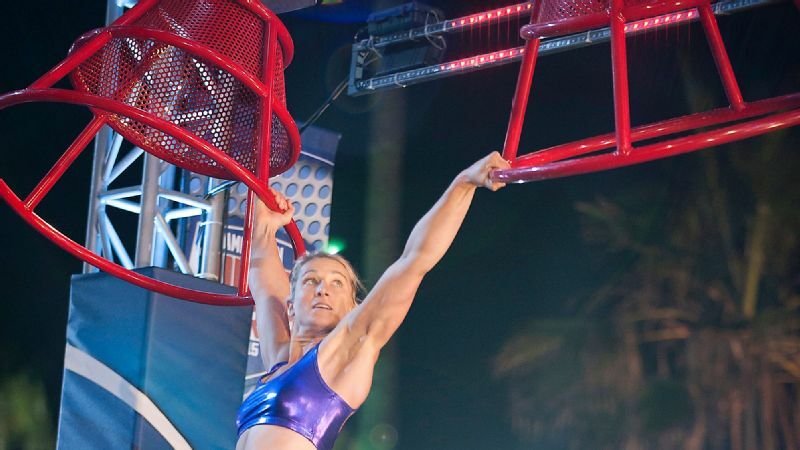 Casey Suchocki attempts the Propeller Bar in "American Ninja Warrior" national finals. Next is the all-new Giant Log Grip. Competitors wrap their bodies around a log and ride it to the end of the track, where they must drop onto a small platform in the water. Timing is everything with this obstacle. Just a small dip into the water ends a ninja's season. 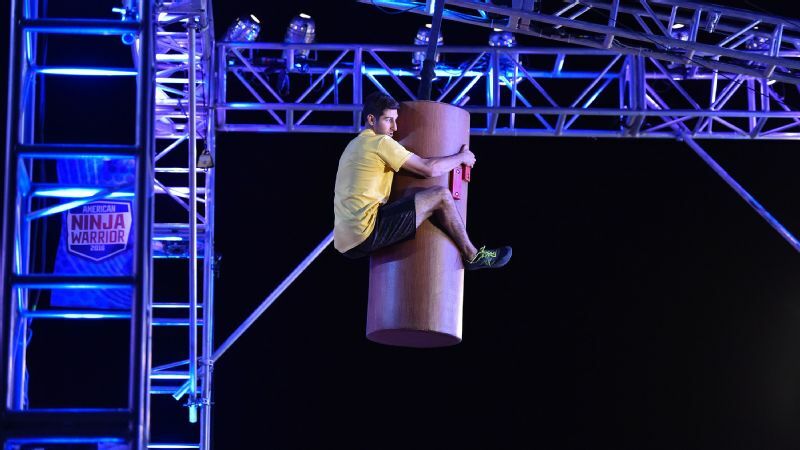 Anthony DeFranco takes on the Giant Log Grip in "American Ninja Warrior" national finals. The fourth obstacle is the Jumping Spider, a notorious ninja killer. Ninjas use a trampoline to jump into a suspended hallway. Bracing themselves against either wall, they must hop through the channel to the next platform. 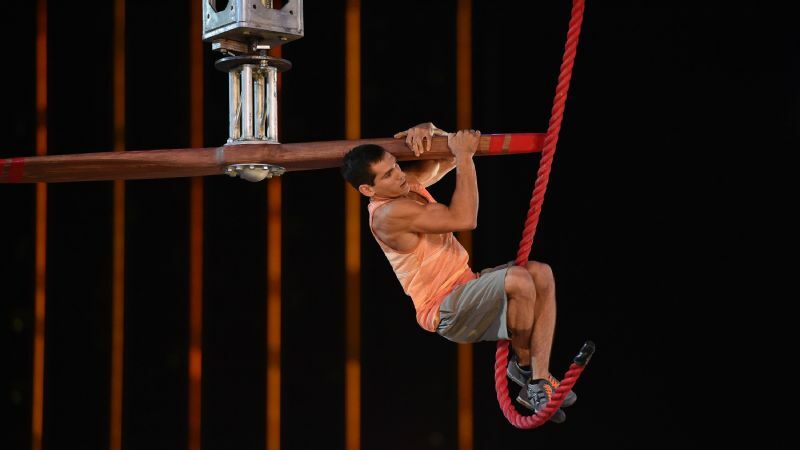 Karsten Williams attempts the Jumping Spider in "American Ninja Warrior" national finals. Sonic Curve is another returning obstacle. Competitors run along the separated and curved steps toward a rope, which they use to swing to the next platform. 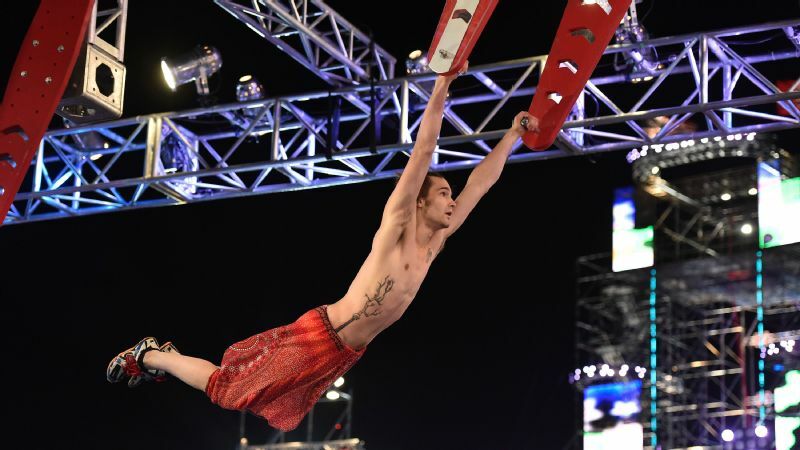 Liam Buell jumps to the rope on Sonic Curve in "American Ninja Warrior" national finals. Awaiting competitors at the sixth obstacle is the Warped Wall, only this time, there is just half the run-up space. 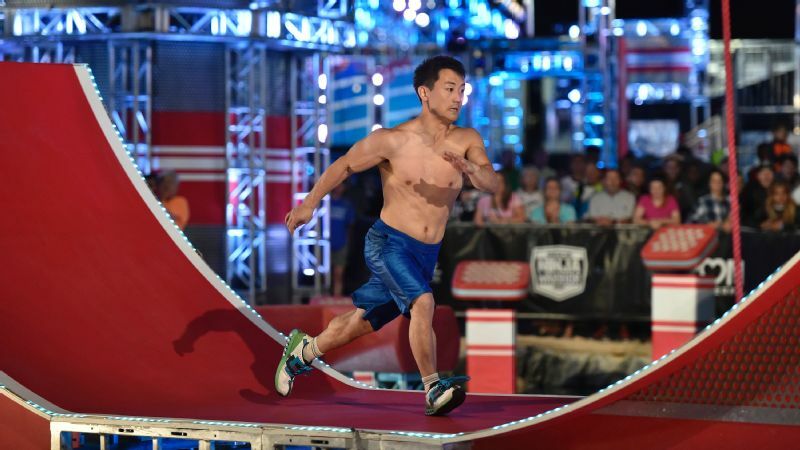 Tyler Yamauchi attempts the Warped Wall in "American Ninja Warrior" national finals. For ninjas who get this far, they are faced with a new obstacle, Broken Bridge. Competitors run over a series of disconnected steps that swing beneath their feet. 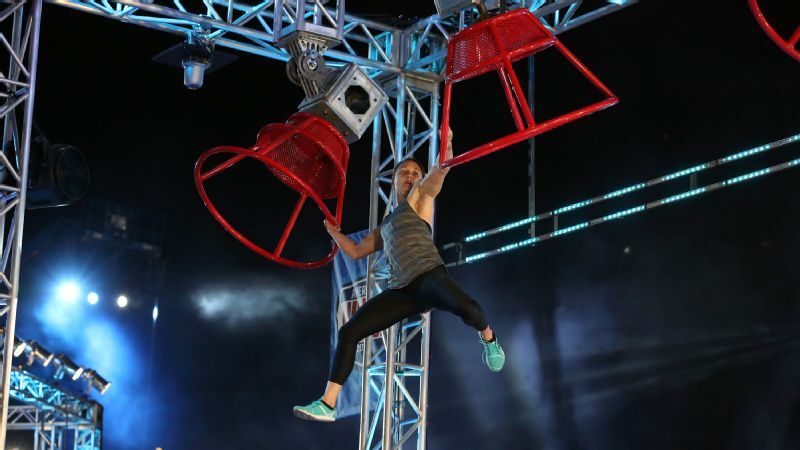 Grant McCartney takes on the Broken Bridge in "American Ninja Warrior" national finals. The last obstacle, the Flying Squirrel is also new. Competitors jump to a pair of suspended handles and use the momentum to lache to another pair. Then, they jump to a cargo net that they climb to the top platform and hit the buzzer. 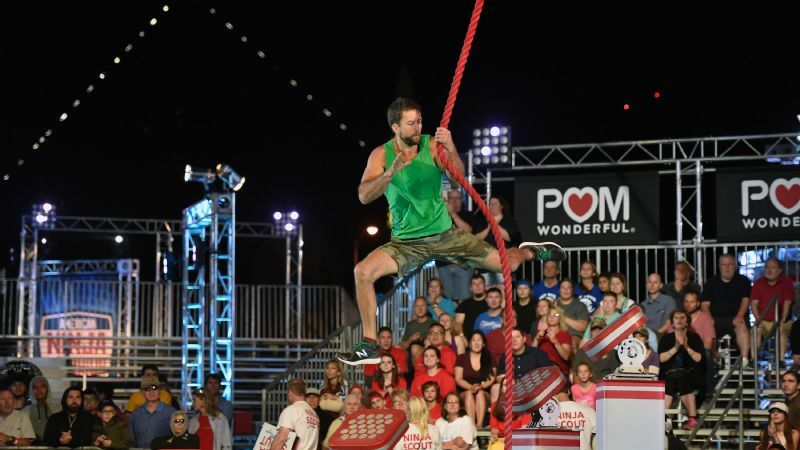 Thomas Stillings swings through Flying Squirrel in "American Ninja Warrior" national finals. If they do all of that in under 2:20, they move onto Stage 2. This is where the real fun begins! Next week is the second episode of the Las Vegas finals, featuring the other half of the Stage 1 runs. 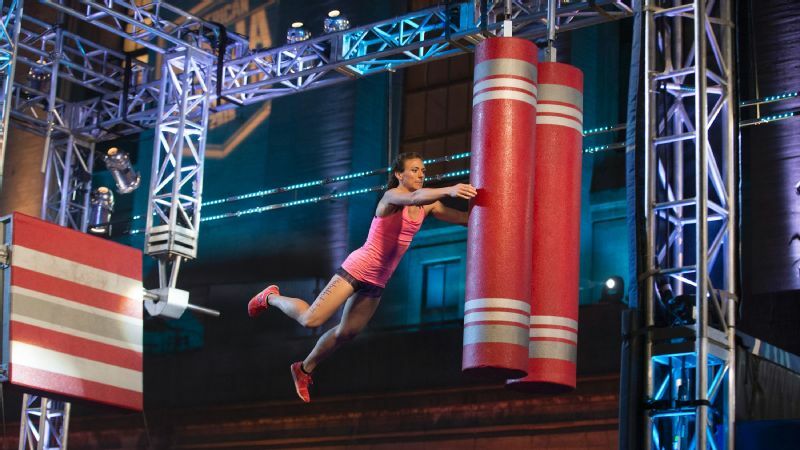 Expect to see favorites such as Kacy Catanzaro and Meagan Martin.